Do you sell the tray 3 as a separate unit for the HP 4650dtn colour laser printer? Unfortunately, we do not sell spares or accessories such as this. We feel it is far better to only offer laser printer cartridges which are the leading quality for your printer. If you expect LaserJet 4650-dtn laser supplies that you simply won't have to keep worrying about, purchase with Cartridge Save today. Here at Cartridge Save we won't concede anything for customer support and the quality of our HP printer toner cartridges. Now you can save money at Cartridge Save thanks to complimentary delivery. We take great pride in the fact that 98% of orders placed with us get delivered the next day. Have complete satisfaction when you place an order with Cartridge Save because of the cast-iron cash-back policy. In case you have any troubles with your HP LaserJet 4650dtn laser toner cartridge inside 12 months after buying you can simply send it to us to be sent the 100% cash back. When you would like to spend less cash, you need to shop at Cartridge Save! Fast and promising excellent colour output, the HP Colour LaserJet 4650dtn is a good choice for home offices and small offices looking to improve efficiency and productivity. However, the cost per page is high, especially when compared to competing models. The Colour LaserJet 4650dtn laser printer is engineered to be fast with improved calibration and a quicker power cycle, so users can already print in speeds of up to 22ppm. It has a user-friendly control panel with a backlit status LCD that is large enough for easy reading and navigation of menus. 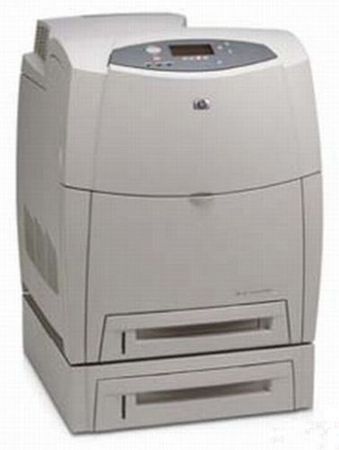 The HP Colour LaserJet 4650dtn runs on a 533 MHz processor with an installed 160MB RAM, which can be expanded to 544MB. There are 2 standard paper trays but it can accommodate up to 4 trays to increase its input capacity from 600 sheets to 1,600 sheets. Because of the speedy processor and ample memory, the HP Colour LaserJet 4650dtn is considered a fast performer that delivers excellent output in text, photos, and graphics. Users can save time and resources with the duplexer, and efficiently accomplish bulk printing with the high 1,600-sheet capacity of the HP 4650dtn. It is possible to install an additional hard disk into the Colour LaserJet 4650dtn printer if required. At 1.6 pence per page on average (monochrome), the running cost of the HP Colour LaserJet 4650dtn is expensive. It is also very heavy, weighing approximately 44kg. The Hewlett Packard 4650dtn printer could be better if it had direct-printing features. Slots for a USB flash drive and memory card readers, as well as built-in Wi-Fi would be nice but this lack of connectivity doesn't significantly diminish the printer's good overall specification.